The more you dine, the more you earn! One-time membership fee of $25. As a member you'll receive a $20 Western Concepts gift certificate and a restaurant ball cap. Points will be awarded for dining at Sushi Neko, Musashi’s, The Hutch on Avondale, The Tasting Room, Will Rogers Theatre, and The Lobby Cafe & Bar. You’ll earn 1 point for every dollar you spend on food and beverages in the restaurants, and 1 point for every $5 you spend on banquet and catering services from The Tasting Room and Will Rogers Theatre. Points are not awarded for taxes and gratuities. Your card must be presented at the time of point accumulation and redemption. Points will be reset at the end of each year. 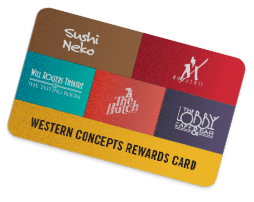 Western Concepts Restaurant Group reserves the right to alter or modify the terms and conditions of the Rewards Card Program at any time.